It consists of three lagoons: La Veguilla, Camino de Villafranca and Las Yeguas. La Veguilla receives contributions from the purified water of the Sewage Treatment Plant of Alcázar de San Juan, that is why it has water throughout the year. The other two are semi-seasonal, depending on the precipitation volume and the contributions derived from La Veguilla through a canal, so their current ecological characteristics differ from those of the first. In the paths that cover them, we will find points of observation of birds, alternating saline and desert landscapes, that change to steppes and later to become wet meadows. These changes make this space, protected by UNESCO, its greatest attraction. 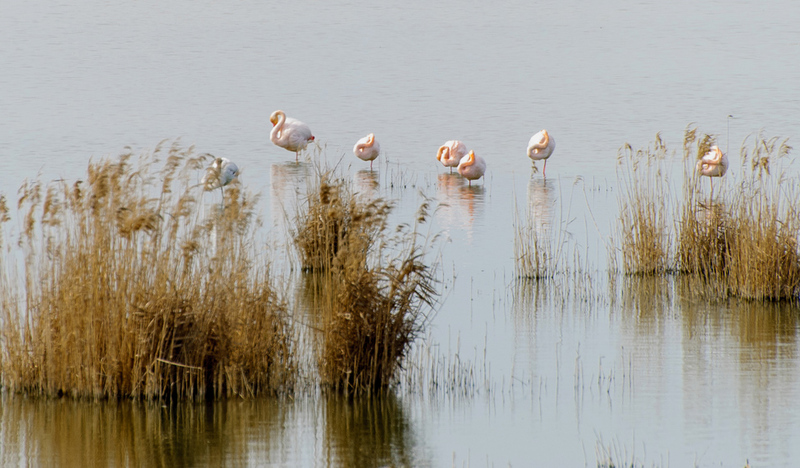 This lagoons are of great importance as a breeding and wintering area for a large number of birds associated with wetlands (anatidae, waders, flamingos). The vegetable formations associated with the saline and tamarix spaces are also noticeable. We will certainly see birds hard to find anywhere else. The aquatic birds community is undoubtedly the most important at a faunal level. Throughout the year you can see storks, gull-billed terns, little gerbes, common and ruddy shelducks, common pochards, white-headed ducks, red-crested pochards, mallards, garganeys, Eurasian coot, squacco herons, purple herons, western marsh harriers and flamingos. In the lagoons surrounds, we can see species like the black-bellied sandgrouse, pin-tailed sandgrouse, lesser kestrel, hen and Montagu's harrier, common pratincole, little bustard, black and red kite, or the osprey. The visit must be arranged at the Consejería de Medio Ambiente (+34 926279531) or at Alcázar de San Juan Tourism Office (+34 926540707). From the observation centre, a trail starts to various observatories on the banks of La Veguilla lagoon. 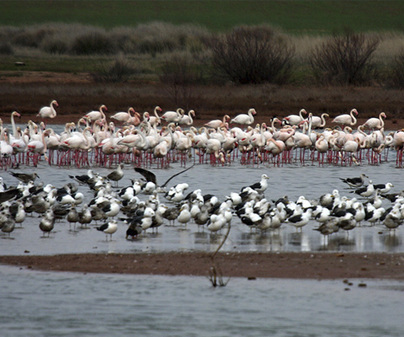 In the lagoons of the Camino de Villafranca and Las Yeguas there are observatories next to its shores. We can access them by a road for vehicles. From the municipality to the lagoons, you can arrive by the CM-4133. The visiting season is from March to June and from October to December. Do not forget the camera to photograph the birds.